Try it and You May! 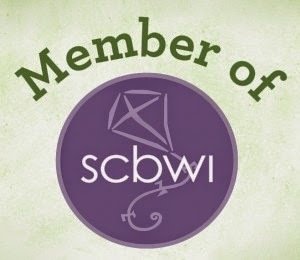 : Win Prizes - Gift Cards and Bikes! Win Prizes - Gift Cards and Bikes! I declare bike season open in Pittsburgh! And to celebrate I have two $25 gift cards to Max & Erma's Restaurant to give to two lucky cyclists! (Rafflecopter is a bit lower in the post). Ok, some people have riding already, but on Wednesday I not only saw lots of bike commuters, I rode my own bike for 45 minutes at North Park and really shook the winter dust off of it and me. And with perfect timing to celebrate my season opener, Max & Erma's contacted me and asked me to help them celebrate National Bike Month - Hooray! 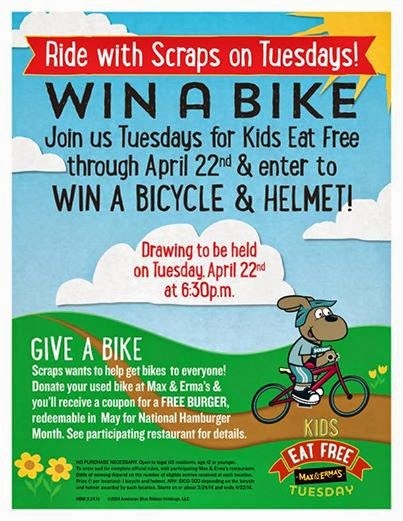 "Max & Erma’s restaurants is inviting kids to join their kid-loving dog and mascot, Scraps, to “Ride with Scraps” and enter to win a new bicycle and helmet. Every kid’s meal ordered at area Max & Erma’s from March 24-April 22 will receive an entry into the drawing to Ride with Scraps. The drawing will be held on Tuesday, April 22 at all participating Max & Erma’s restaurants." National Bike Month is sponsored by the League of American Bicyclists. I didn't know there was a League. Even though I'm a nervous cyclist, my boys love riding bikes so when I heard about this contest, so we headed up to our nearest Max & Erma's and got some delicious carry-out and three entries into the bike giveaway. I'm trying to reduce my sugar and carb-intake, so I got a turkey, swiss and avocado burger without the bun but LOADED with mushrooms and it was incredible. The kids devoured their sliders, too. In addition to giving away one free bike at every restaurant location, I also learned that Max & Erma’s is hosting a used bike drive. Each restaurant is choosing their own drive date, but when you donate a used bicycle, you get a coupon for a free burger. This is also perfect timing for us because we wanted to at least one of our boys needs a slightly larger bike and now we can donate his slightly used bike to Max & Ermas, who will pass them on to local children's charities, and we get more burgers! Here's how YOU can win a $25 gift card from me (and the folks at Max & Erma's). To enter to win a gift card, you can comment, tweet or share on Facebook anything you want about cycling and make sure you click through on the Rafflecopter. The bike drawing happens April 22, but my gift card giveaway ends April 25. And if you don't win, but want to go for a bike ride with us anyway this summer, send me a note. We're ready. 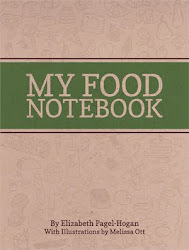 You can get more at their press room and at Max & Erma’s Facebook page, and on Twitter .